Jan Ziff's "Sound*Bytes" is a national radio show carried by the 500 stations on the CBS Radio Network. Ziff featured The Old House Web on her Jan. 29, 2006, show. "When you own an old house you face special challenges," Ziff said. "How to maintain those antique fixtures. How to repair a tin ceiling. How to clean vintage linoleum and how to keep your old house a healthy house. "The answers to these questions and a lot more can be found at The Old House Web -- that's www.oldhouseweb.com - the web site of, by and for old-house enthusiasts. "Whatever your architecture, whatever your style, you'll learn all you need to know about the problems and the rewards of old-house living. ... Old houses, new ideas, all right here at The Old House Web." 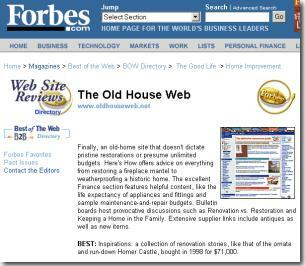 The Old House Web has been named one of the "Best of the Web" by Forbes Magazine. The site was one of just six home improvement-related sites selected by Forbes as the Web's finest. Forbes editors reviewed more than 3,000 sites in 22 different categories, including "Home Improvement," making their selections based on overall content, design, navigation, speed and customization. The story appears in the magazine's special Best of the Web issue - as well as on Forbes.com. "Finally, an old-home site that doesn't dictate pristine restorations or presume unlimited budgets. Here's How offers advice on everything from restoring a fireplace mantel to weatherproofing a historic home. The excellent Finance section features helpful content, like the life expectancy of appliances and fittings and sample maintenance-and-repair budgets. Bulletin boards host provocative discussions such as Renovation vs. Restoration and Keeping a Home in the Family. Extensive supplier links include antiques as well as new items." 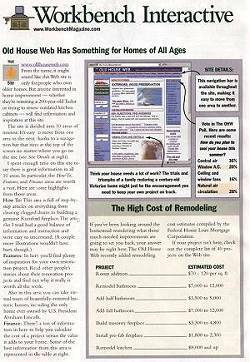 The Old House Web was the subject of a feature story in the Technology Section of The New York Times. 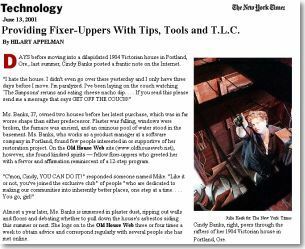 Spotlighted in the article "Providing Fixer-Uppers With Tips, Tools and T.L.C." were OHW bulletin board regulars Cindy Banks and Nicki Hendrix. Banks, a software product manager, and Hendrix, a public relations manager, are women who have power tools and aren't afraid to use them. They just need a little encouragement from time to time. That's where OHW's bulletin boards come in. Nearly a year after her initial post, Banks told the Times that she still logs on to The Old House Web three or four times a week. Hendrix, who is working on a 1905 house in Athens, Georgia, also visits regularly. "I hate the house," Banks wrote of her 1904 Victorian in Portland, Oregon. "I didn't even go over there yesterday and I only have three days before I move. I'm paralyzed. I've been laying on the couch watching 'The Simpsons' reruns and eating cheese nacho dip... If you read this please send me a message that says GET OFF THE COUCH!" Old House Web readers quickly responded, encouraging Cindy. "You go, girl!" wrote one person. Many women interviewed for the Times article said they often felt more welcome online than in lumberyards -- and the Times article refers an OHW survey showing that slightly more women than men use the site. In the story, Times reporter Hilary Appelman talks with OHW's Ken Holmes about the support the site's bulletin boards give to old-house enthusiasts: "They want to know they're not alone out there, that there are other people who have lived through the plaster dust and the torn-up rooms." "THE place to look ..."
The Old House Web is THE place to look for the most complete listing of suppliers and ideas to help you restore any older home. Owners of old houses have a unique set of home-repair and restoration problems, such as cracking plaster and finicky fireplaces. The Old House Web homes in on those repair problems and others ... Browse how-to articles by subject. Thinking of building a new home with a traditional design? Take a virtual walk through numerous floor plans. Bottom line: If you live in an older home or want to own one, bookmark this site. "Old House Web Has Something for Homes of All Ages"
"Anyone interested in home improvement -whether they're restoring a 200-year-old Tudor or trying to renew outdated kitchen cabinets - will find information and inspiration at this site." HOW-TO TIPS: The clever, comprehensive Web site at www.oldhouseweb.com is plastered with remodeling and historic restoration how-to and do-it-yourself advice for owners of historic, old and antique houses. Bone up on building products. Find out how to remove that pesky dried epoxy on your tile, or strip paint off a beadboard ceiling. Check out restoration tales from other homeowners. Homestore.com: "The art of renovating a historic home." Experts say it's vital to have more than a working knowledge of what's involved in a professional renovation project, even if you aren't going to contribute any sweat equity. "Most people aren't going to do a lot of work themselves, but they bone up as much possible from as many sources as possible. The craftsmen may know the process, but the homeowner needs to be the expert on it, and that level of self-education always helps," says Kendall Holmes in Silver Spring, Md. "For more information: Old House Web - Check out this site for good editorial how-to content focused on the repair and restoration of old homes." "On-ramps to the net: There are so many Websites out there, where do you start? "Here are some terrific sites for you to check out. Calling itself a community for old-house owners, www.oldhouseweb.com has articles, products and bulletin boards. "One of the largest investments we will probably make in our lives will involve our homes. The Old House Web is a fantastic place to start. "The search engines are fantastic. It will help you locate suppliers, stories, and products with such ease; you will ask yourself how you got along without this site. Professionally organized, and great looking, the whole experience was very interesting and full of information." The Old House Web is a clever, comprehensive site plastered with remodeling and historic restoration how-to and do-it-yourself advice for owners of historic, old and antique houses. Bone up on building products. Find out how to remove that pesky dried epoxy on your tile, or strip paint off a beadboard ceiling (it's not pretty). Check out restoration tales from other homeowners. "NEW PRODUCTS FOR OLD HOMES"
"Whether it's product information, restoration advice, or just a sense of community you're seeking, the Old House Web is likely to have exactly what you need." "Offering both sources for old-house products and ideas for tackling hundreds of restoration products, the Old House Web is sure to impress restoration enthusiasts." "Features of this site include a searchable directory of hundreds of companies offering products to the old house community, a restoration library with hands-on advice on many old-house topics, a restoration store where visitors can purchase a plethora of restoration equipment, searchable bulletin boards where users can ask questions and get answers, plus a variety of other fun extras."